It can be coiled, twisted, formed, bent and linked together without any need for soldering. a truly unique and durable Rosary. If you are not familiar with the Wrapped Loop Method of connecting beads, sometimes called a "Wire-Wrap Rosary" you will first need to learn the proper way to handle the wire and obtain the necessary tools used for working with Wire. or Flat Nose Pliers will work just as well. We've also used thick 16 gauge wire for illustration purposes. 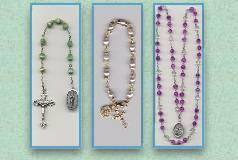 Our Rosary Makers prefer a thinner 20 - 22 gauge wire to make a Wrapped Loop Rosary. Cut a piece of Wire 2 1/2 inches longer than the Bead. Grasp wire with Pliers about 1 inch from the end. Bend wire over jaw to form a sharp angle. to form about three-quarters of the first Loop. on the unwrapped part, and complete the wrapped loop. wire tail around the neck of the loop 3 times, holding the tail to wrap with a second pair of Pliers. When the wrap is tightly coiled and you are happy with the way it looks, snip the excess wire. Place the flat side of the Wire Cutters close in against the wraps and clip the wire tail. To avoid sharp edges, tuck the wire tail by squeezing gently with Flat Nose or Bent Nose Pliers while twisting gently in the direction of the wrap. This is known as "tempering" or the wire. Thread Bead onto Wire. Grasp Wire with Pliers at the other side close in to the bead. Bend the wire around the Pliers jaw, again forming a sharp angle. Follow the steps to wrap the tail 3 times as shown above; clip and tuck and temper. and practice the Wrapped Loop in a continuous motion. practice the Wrapped Loop method on different sized beads and different gauge wire. In no time at all you will feel confident and be pleased with your Loops. of that partially formed loop. Make the second wrap close in to the bead, leaving little or no room for the bead to move back and forth on the wire. Clip excess wire, tuck and temper as usual. as you complete the decades. with a length of chain as usual. Our Rosary Makers build the Decades first, then attach the completed work to the Crucifix and Center Piece. 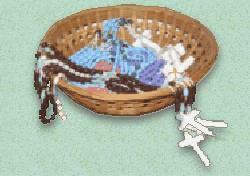 and Rosary Makers Supplies, at affordable prices. who request them through our website.